Birth of a Play(wright) - Phase II: How much history and how much fiction? How much history and how much fiction? My play is a piece of historical fiction. Meaning, I am taking a piece of history and telling a fictionalized account of it, rather than attempting to make a completely factual documentary. (The phrase "inspired by true events" would be appropriate.) Though historical fiction is my favorite literary form, I have never before attempted to write such a work. It has its challenges. Mainly, how much history and how much fiction do I put into the story? When I am reading a work of historical fiction, I like to believe when I am reading it that pretty much everything that I am reading is true. And I do believe it is true, unless it is a about an aspect of history I know particularly well (like the movies Amadeus and Immortal Beloved), and can easily spot when creative license is taken. Since very few people will be experts in the piece of history I am telling, this could either absolve me -- who will know? -- or it could mean I have a greater responsibility to tell the story as accurately as I can, since this play (movie?) may be the only exposure most people will ever have to the subject. My decisions fall into two categories: the events of the play vs. the world of the play. I have decided that the events of the play can be fictitious -- in fact, they should be, otherwise I would be dealing with rights issues -- while the world should be as factual as possible. The details must be accurate so that the audience feels that "that could have happened" (even if it didn't). If the details of the world make people raise their eyebrows -- that city didn't exist then, people didn't talk like that then, a black band couldn't have played in that club then -- then the whole story will be unbelievable. Thus I found myself in the library this week, looking at issues of Down Beat magazine from 1943 on microfilm. 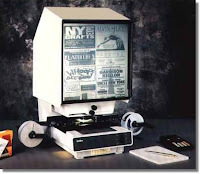 MICROFILM. Yes, it still exists. No, everything in the universe has not been scanned into google. Alas, because there is no "search" button on a microfilm machine. All you can do is go through one issue after another, page by page, hoping to find the little tidbit you are looking for. But this play deserves every bit of time and effort and energy I can put into and more, so I'll be back there next week, going through more microfilm so that the world of my play can have as much history in it as possible.